This is from a Renault press release covering sales during 2012 (despite the name) edited down to focus on the European market. 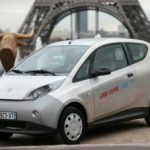 References to Renault’s electric vehicles are in bold; there is just a brief mention of the Zoe launch in 2013 at the end of the main text. Note that in the same week it has been reported that Renault will be making 7500 job cuts. The Renault group is successfully pursuing its international offensive. In 2012, the Group set a new record outside Europe with 1,279,598 vehicles sold (+9.1%). For the first time in its history, the Group generated more than half of its sales outside Europe. However, this international success did not offset an 18% fall in sales in Europe. Overall, with 2,550,286 vehicles sold worldwide, Group sales were down 6.3% on 2011. In international regions: the Group set new records in sales and market share in two regions, the Americas and Eurasia. Brazil and Russia are now the Group’s second and third biggest markets respectively. In Europe: against a backdrop of market crisis (-8.6%), and efforts to defend margins and restructure the sales offering in the UK, the Group had market share of 9.1% (-1 point) and sales of 1,270,688 vehicles, down 18%. Renault expanded its electric range in 2012, with Twizy, which has topped sales of 9,000 units since launch. With Fluence Z.E. 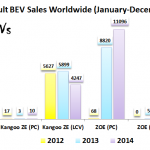 and Kangoo Van Z.E., Renault is No. 1 on the electric vehicle market in Europe with market share of 28%. Launched in fourth-quarter 2012 in Europe and Turkey, New Clio is a success with its audience. In the LCV market, the Renault brand increased its market share in international regions and in Europe, maintaining its leadership for the 15th consecutive year, with market share of 15.5%. “The Group’s international expansion strategy is bringing results. In 2012, we set a new international sales record with the Renault and Dacia brands. Nevertheless, this success could not totally make up for falling sales in Europe. In market conditions that were tougher than expected, we sought primarily to defend our margins,” said Jérôme Stoll, Member of the Executive Committee, Executive Vice-President, Sales and Marketing & Light Commercial Vehicles. Renault sales were down 6% on 2011, despite growing by a strong 13.9% outside Europe. With 2,124,773 units sold, the brand accounts for 83% of Group sales. Dacia sales rose 4.8% to 359,822 units, buoyed by the expansion of the range in 2012 with the arrival of Lodgy (an MPV), Dokker (the first LCV), and the renewal of Sandero and Logan. Renault Samsung Motors saw sales fall 44.4% to 65,691 units. The brand is restructuring its sales network and product offering and targeting a recovery from 2013. New SM5, the first vehicle launched since the roll-out of the brand’s Revival Plan, has made a good start. In a market in crisis, Group sales fell by 18% for market share of 9.1% (-1 point). The Renault brand is No. 3 on the passenger car/LCV market. Against a backdrop of strong price pressure, pursuit of a virtuous policy in pricing and sales by channel, despite the ageing of the range, prior to the launch of New Clio. The Renault brand confirmed its leadership in LCV sales for the 15th consecutive year, with market share of 15.5%. 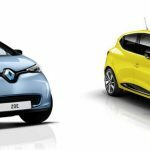 Renault is the first brand to offer a range of four electric models, and is European leader with market share of 28%. The Dacia brand expanded its product offering with the launch of Lodgy, taking market share of 1.6%, a rise of 0.1 point. In France, where it ranks No. 6, Dacia increased market share by 0.1 points to 3.7%. In Spain, brand market share rose 0.6 points to 2.3%. 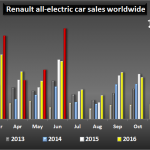 In France, despite a 24.7% fall in sales, the Renault brand remains No. 1 for passenger car sales. Twingo, Mégane and Scénic are all leaders in their segment. In LCV sales, the brand dominated the market with market share of 32.1% (+0.1 point) despite a 10.1% fall in registrations. 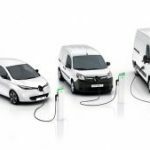 Kangoo, Master and Clio Fleet are the three best-selling LCVs, all brands. Group sales outside Europe accounted for 50.2% of the total, compared with 43.1% in 2011, a rise of 7.1 points. With 1,279,598 vehicles sold, the Group set a new sales record and made progress across all regions. International growth was driven by products tailored to the needs of international customers (Pulse, Scala, Novo Clio, New SM5, etc.) and by the local production of vehicles based on the M0 platform (Duster, Logan). Brazil and Russia are now the Group’s second and third biggest markets respectively. The Renault brand now ranks No. 3 in Russia. It is No. 5 in Brazil, with sales well above the 200,000 mark. LCV sales on international markets rose 14.6% to 99,690 units (29.6% of the total volume, a rise of 5.6 points). In 2013, the global market is expected to grow by 3% on 2012, while the European market is expected to fall by at least 3%. “Building on its international development strategy and the launch of attractive new products, the Renault group is setting a course for growth in 2013. We will pursue our development strategy in international markets. In Europe, our objective is to win back market share while continuing to implement a virtuous commercial strategy. Our growth will be driven by New Clio, which has made a strong start, and by a major product offensive with the launch of Captur, ZOE, New Clio Estate, New Symbol, New Logan, New Sandero, New Fluence and Novo Clio,” said Jérôme Stoll, Executive Vice-President, Sales and Marketing & Light Commercial Vehicles.